"If it looks right, it flies right.."
The Boeing Stearman is not really overpowered in its original, 220hp configuration. Performance-wise it can be compared to a Waco, Bücker, Stieglitz, Tigermoth, and other basic aerobatic airplanes. We are installing bigger engines with a higher power output, comparable to the engines of the Stearman 73/76 fighter versions, providing the pilots with excellent performance and a high fun factor. 300-360hp, fuel injected, Jacobs R755-A2 engine. All these engine will be installed together with a Hamilton Standard constant speed propeller, a hydraulically operated aluminum prop, providing extra performance. 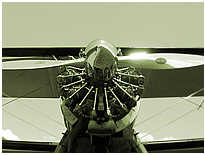 The Stearman is a big airplane and when doing aerobatics the flight controls feel like this. 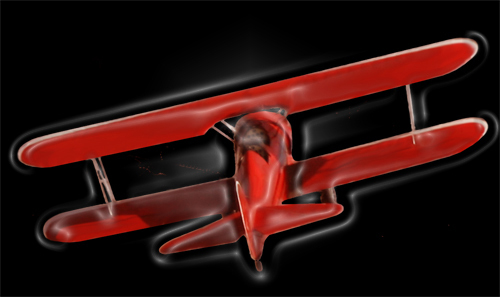 To give you a responsive aerobatic airplane with light and quick controls an extremely effective 4 AILERON SYSTEM - the Pemberton system - is installed. In combination with two servo tabs it minimizes the control forces and gives you an excellent roll-rate. These modifications provide an impressive change to the flight characteristics and performance. Equipped with this system, in combination with a number of other modifications, the Stearman Special stands in a row with the classic biplane fighters and can outperform most of the aerobatic airplanes from the golden age of aviation and even some of the modern aerobatic trainers. 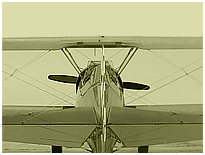 The new windshield design is borrowed from the Stearman Model C-4. This cuts down the wind in the cockpits and improves forward visibility by a great extend. Due to the higher seating position of the pilot you can see straight ahead, over the nose of the airplane when in cruise flight, which is a real safety factor. This airplane shows modern safety features like hydraulic disc brakes, an improved seatbelt system, new designed engine mount and upgraded engines, a modern electrical system, etc. Basically the safety factor can be increased to a great extend by starting with a totally stripped down fuselage frame, not hiding any weak points under the paint, with all new and reinforced wings, by avoiding a low price - low quality engine overhaul and other measures. .... in the end the Stearman pilot wants to have fun without worries. ...or you might go for a classic custom / aerobatic paint-scheme of the 1920s and 30s. In regard to design as well as engine and flight performance this STEARMAN SPECIAL is a unique biplane and top performer. In case you want to "personalize" this airplane even further we are prepared for the integration and (EASA/FAA) certification of any additional wishes from your side, installing different engines like the 300 HP Lycoming R680, smoke systems, etc.